This is our selection of 3 button suit jackets that can either be purchased on their own, or with matching trousers, skirts and waistcoats. Please have a look at the design you like best, and click through to the collection page for that garment, and you will see that everything within a collection matches. This means that you can have 2 jackets, a skirt and trousers and can be alternated depending on the day of the week! Enjoy! If you have any questions, please ask. The Essentials range from Skopes incorporates machine washable, natural stretch and crease resistance. 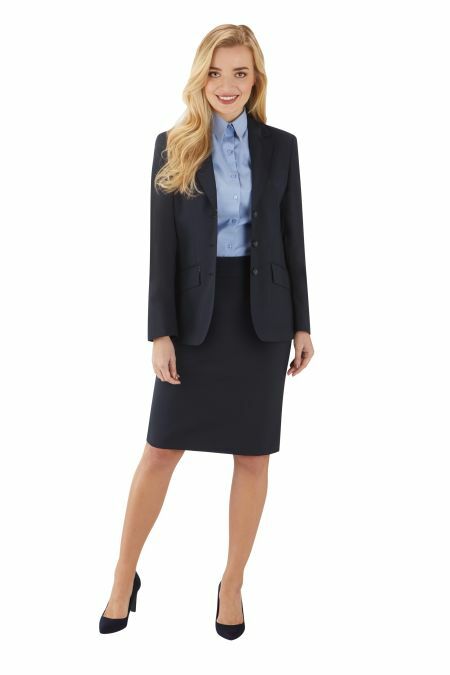 Single Breasted, 3 button with peaked lapels, central vent and inside pocket. 2 external flap pockets, and fully machine washable. Tailored fit 3 button single breasted jacket. Stylish Skopes 3 button Single Breasted Juliette Jacket with stiched edge lapels and pockets.